To see the New Year come in. We stayed in as usual this year. We had a fabulous dinner of prime rib, scalloped yukon gold potatoes with blue cheese and bacon, steamed asparagus and these tasty little gougeres with my favorite cheap red wine. The cheesecake sampler I picked up at the grocery has not been touched. 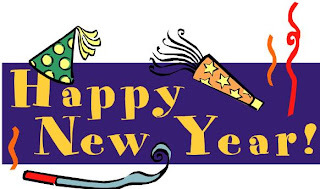 Best wishes to everyone for a happy, peaceful, healthy and generous new year! Hope to see you all down the road. 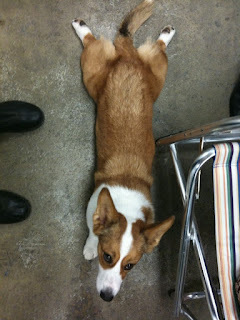 Scout knows just how to curl up around your feet. Lindsey just sent this. 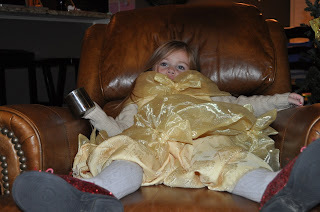 In Avery's world, a cable knit sweater and socks and ruby red slippers are perfect princess dress accessories. This picture is tugging at my heart. Cheryl sent it today - she is housesitting in Franklin (about 2 hours away from me) for friends out of town for the holidays, and Scout and Spencer are hanging with her while I have been traveling back and forth across the state. 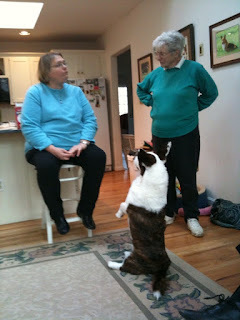 I thought the timing was perfect for this - Scout is getting her hips checked on Monday by a vet in Franklin who is known for being the go-to guy on getting the best possible film for OFA. Our family vet did the films on her original test, which came back "fair." I want Dr B to take a look and see if he thinks that is accurate. So, I pick the dogs up Monday after I meet Cheryl at the vet - which means that I have two nights home alone - not sure I can stand it! Scout has spent a fair amount of time away this year as she has been out showing a good bit. I always miss her terribly, but it is spelled somewhat by the fact that I always have Spencer home with me. 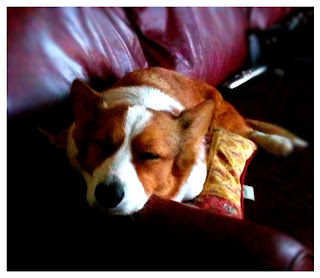 Cheryl sent this picture along and said "See - Spencer is making himself at home" thinking this would make me feel better. 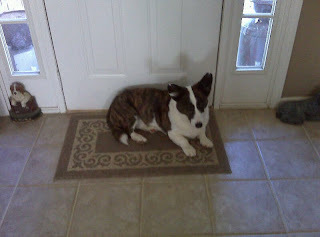 This is not how I see this picture - I see my momma's boy waiting at the door to me to come bring him home!! 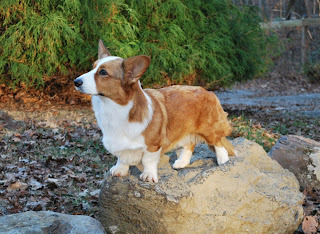 We'll see what tomorrow brings - will I be able to resist trucking over there tomorrow to bring him home and them making another trip on Monday to get Scout??? 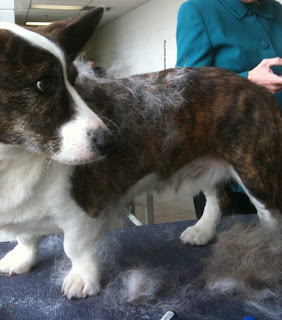 BTW- I had this incredibly wacky dream last night that I was at a dog show. Jeri (of Allegro Cardigans) and her sister were dressed up like Ninja warriors and were doing all this Matrix-like fight exhibitions all over the show site. Wonder what I ate that caused that??? This showed up in the mail today from Doggie Day Care. 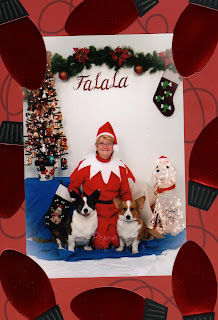 Santa's helper is our good friend Nancy who has been a lifesaver in helping me out taking care of the dogs - she lives nearby and will bring them home from day care for me when I have to work late or have to make a trip to visit Mom. I hope everyone has peaceful holiday - Merry Christmas, Everyone! 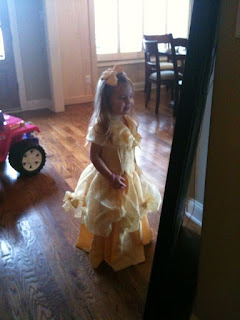 I had promised three year old Avery a princess dress for Christmas. For a while, I was not sure which one of us would survive, but I finally won.
. . . of the Big Apple. 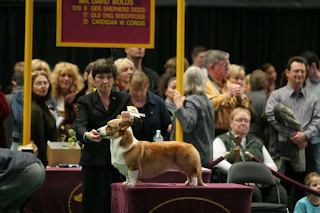 Got confirmation this week that Scout is entered again at Westminster. Laura and I are going to go up again - we're thinking about taking Amtrak this time. 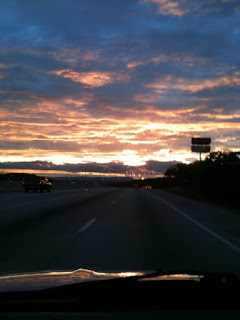 The Crescent leaves Atlanta in the evening and gets to Penn Station early the next afternoon. We had a great time last year, even though I was on one leg and 4 wheels - I had a foot injury and used a knee walker (btw - a jillion times better than crutches - but as usual - I digress.) If you missed reading about our adventures last year, here are the archives from last February. Laura and I were talking this morning about how much more fun it would be if we could talk some friends into going up with us. I have not made room reservations yet, and if we got a few more folks to go, we decided that we could pack along our aerobeds if necessary and make a big old slumber party out of it! So - is anyone interested in meeting us in NYC?? 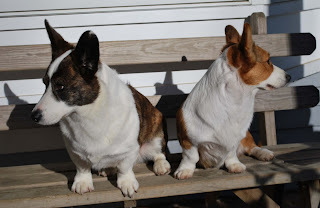 As you may have seen on Taryn's blog, last weekend we loaded up my Element with 3 women (Laura, Cheryl and moi) and 7 dogs (Laura's 5 puppies, Scout and Spencer) and trekked to Maryland to visit Shirley Hobbs. It's about a 600 mile trip each way - we drove up on Thursday and back on Sunday. In between, we talked and laughed and ate and drank wine and visited with friends and played with little dogs and big dogs and just generally had a fine time. We also spent lots of time looking through Shirley's amazing collection of Cardigan memorbilia - years worth of Handbooks, Bulletins and a now-defunct quarterly magazine called "Cardi Faire." 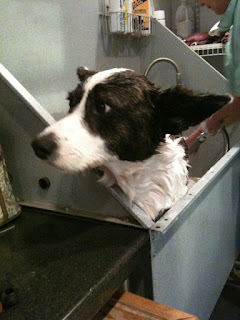 Friday afternoon, Cheryl went into groomer mode and started washing dogs left and right. Spencer had a Christmas Party date this week, so he became one of her victims. It seemed like he spent most the weekend sitting up, working it. 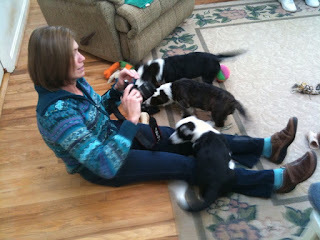 Taryn had fun with the puppies and got some great shots of them - check out her blog. Spence and Scout take a break. 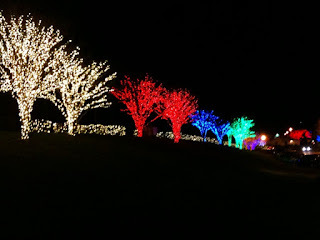 Saturday night we went out for some Maryland crab cakes and enjoyed the Christmas lights on the way. Well - I hope everyone had fun with the Cardi Claus exchange. We had a few packages go astray, and other situations where life just got in the way and delayed deliveries a bit, but I think generally things went well. Cardi Claus made an unscheduled trip to my house as well - thanks Taryn for the picture frame ornament and ceramic tag which looked alot like a little red girl I know. 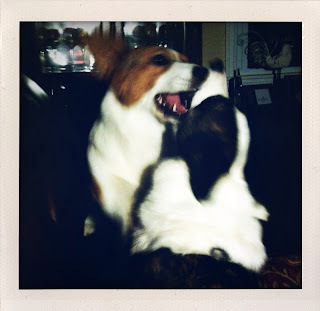 When I first started and training dogs, I realized that most things dog-related just don't seem to be all that concerned about time - a nice way of saying that it seemed like many things dog-related were late for one reason or another. So - it just follows that old Cardi Claus himself might be running late from time to time as well. So - if you are wondering if your Cardi Claus has forgotten you, or maybe if you are a little late in your own Cardi Claus duties, drop me a line at cardibloggerholidayxchange@gmail.com and I'll play elf and communicate with your partner for you. 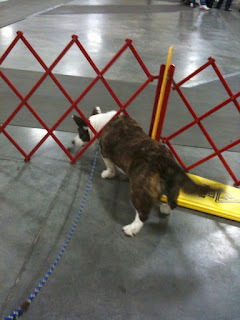 Spencer hates it when I get bored at dog shows . 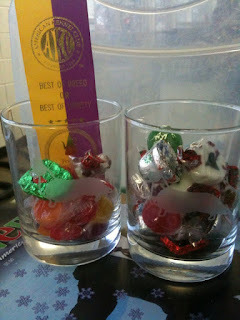 . .
etched cardis and filled with show-sustaining candy for prizes. Cold, wet day in Winston-Salem. We are in Winston-Salem this weekend for our last show of the year. We are staying in a nicer than usual show hotel - but I have to wonder about these folks - the bedspreads are lovely WHITE matelasse coverlets. 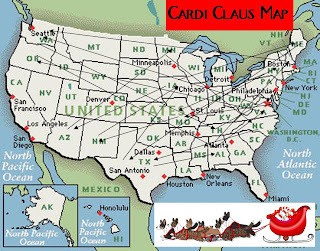 Their internet access is spotty at best, so I may not find all the Cardi Claus sightings as they pop up - leave me a message if I miss one in the list to the right. Scout goes to town on her new rawhide. Meanwhile, Spencer is pacing with his, trying to find the perfect place to hide it. We got up this morning and headed just down the road to the Chickamauga National Battlefield where we met some friends to do some tracking practice. Spencer and I last played around with tracking 3 or 4 years ago when a few of us were just trying to figure it out. A couple of our friends stuck with it and are now working on their TDX and VST titles. They are graciously inviting folks out on Sunday mornings to introduce dog/handler teams to tracking and to share their knowledge. Scout went out first. Bev laid a short double track generously littered with hot dogs. 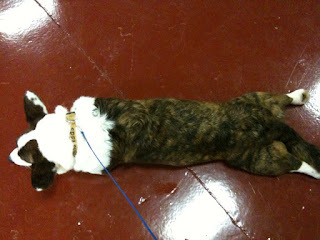 Scout worked very business-like, keeping a straight line right to the finish. Her next track started out with her original track, now extended to twice its original length - the first half now triple-tracked and the last half single tracked. Again she worked very well, moving right down the track with her nose down. Her third track was longer than the second and single tracked, and it was evident that she was losing interest in the hot dogs and just following the scent right down the track. Good girl! Spence was next, and he did very well also. His style is very different from Scout's. While she tended to move in a straight line, Spence weaved back and forth across his track. We are lucky to live close to areas where there are large open public fields for practice - the national park service has preserved a number of Civil War battlefields in our area. 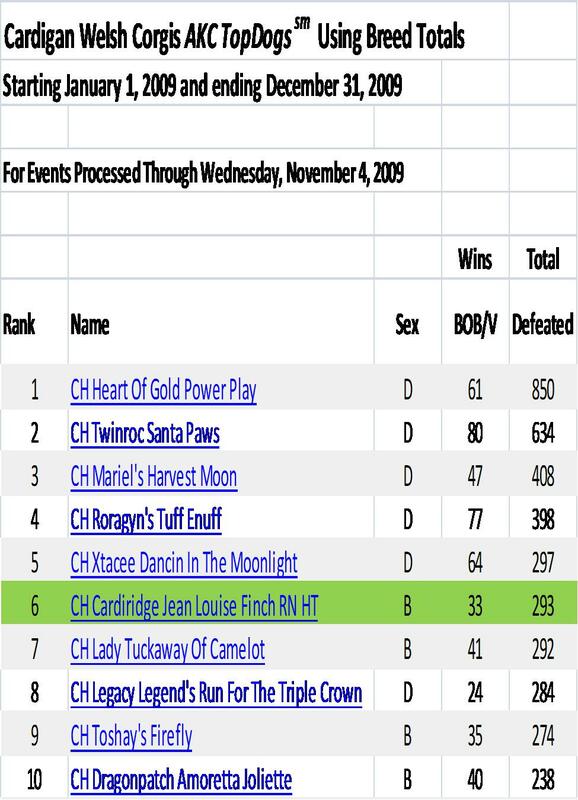 However, I just noticed on the AKC website that they are testing out a possible new title "TDU" (Tracking Dog Urban) because many potential tracking enthusiasts just don't have access to traditional tracking venues. long. I just looked over and couldn't resist snapping her sweet face. It also gave a chance to play with my Photoshop app on my phone. Cardi Claus has made an appearance!! See the link to the right! I will post reports of sightings as I see them!! Scout went Group 4 today under Leah James. Cheryl called me and she is over the moon. The three who placed ahead of her and two others in the group who did not place are BIS winners. We're on the downhill side. I have turned the wheel over to Eric, Mom is snoozing and in two hours we will be back in CHA. I am in the backseat of the Element. Have any of you Element owners actually sat in your backseat? It's like stadium seating at the movie theatre - sitting up high with reclining seats and so much leg room. Eric is 6'6" and even he is comfortable. 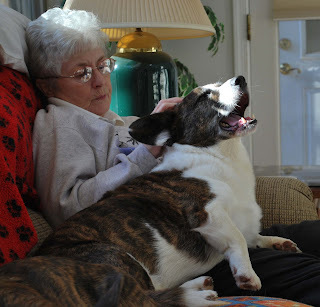 It should be no problem getting Mom home in time for dinner and getting back to spring Spence from the kennel by 7:00. 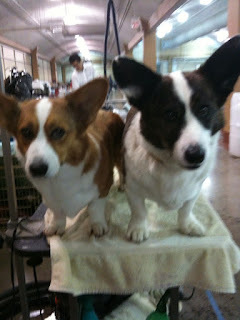 Scout went BOB yesterday and today and we are anxious to see what breeder-judge Leah James does in Group today. 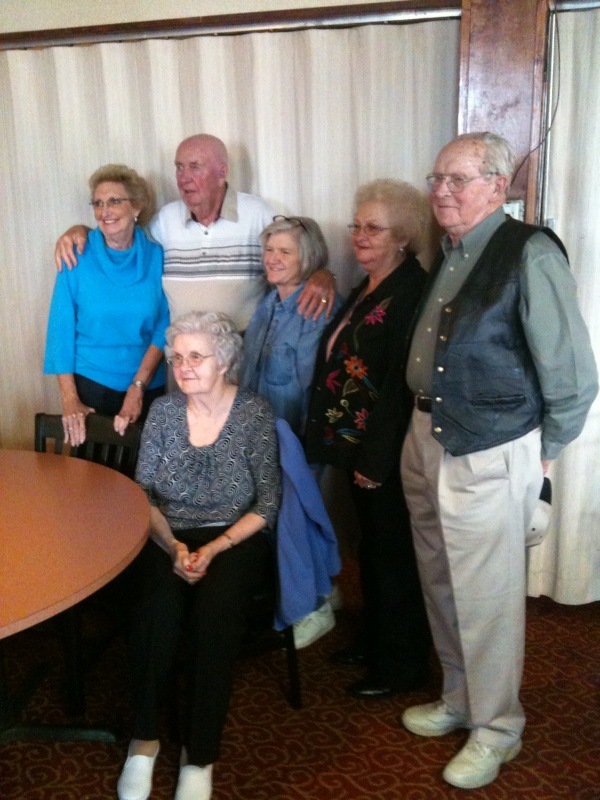 had lunch with her siblings and their families. And lunch at the Henpeck Market. Just because I'm missing her . . . 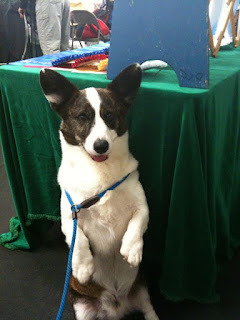 I'm posting some recent pictures of Scout in the ring. 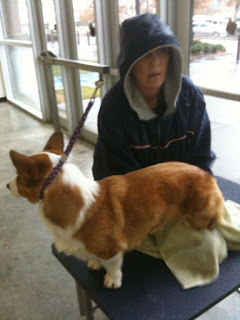 Scout is in Montgomery AL with Cheryl. Tomorrow morning Nancy will pick Spencer up and take him to daycare where he will spend the weekend. I am headed to Athens in the morning to pick up Mom. My nephew will meet us back here and ride with us to Memphis for an early Thanksgiving. This will be our first attempt at traveling with Mom since her stroke 15 months ago. It's a 350 mile trip each way, not counting the 200 mile round trip we will make tomorrow to take her to have lunch with her brothers and sisters. Think happy thoughts for us, and somebody have a margarita waiting for me tomorrow night. Holiday Exchange Update - and updated again! Gift or Ornament Exchange? Ornament! But of course, if you decide to slip a little something extra or different in your package, that's up to you! Secret or not? I guess it would be a secret until you reveal yourself when you send it. A point of this is to make/renew friendships - hard to do that if they don't know who you are! Your recipient's address - if my email to you did not include an address, let me know, because I have everyone's address. Gmail seems to be a little persnickity on forwarding a thread of email, or maybe I'm just dumb. Is it too late? - I have heard that some intended to join but missed the deadline, and another beat the deadline but her email landed in the Spam box and I didn't notice. If anyone still wants to play, email cardibloggerholidayxchange ^~at~^ gmail and I will try to hook everyone up. If you signed up for the Cardi Blogger Holiday Exchange, you should have received an email telling you who you are playing Cardi Claus for! Let me know if you did not receive it or if I did something lame like telling you that you are partnered with yourself. There are no rules here - this was intended to be just a fun opportunity to share holiday fun with other folks who love our short little dogs. Some have asked if there is a $ limit - but I am just not into having alot of restrictions. Have fun, and hopefully make a couple of new friends!! I guess the only rule might be to try to have packages delivered by December 1 to maximize holiday fun. 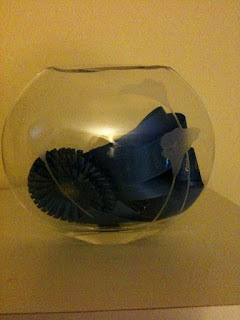 OK - one more rule - I hope everyone will share via their blogs about their experience! We just missed the fancy invitation to the Garden. At least the weather was lovely and the company was good. Spence wants a job cleaning up after the show is over. OK - I have figured out the mystery of how my co-workers misjudged my birth year. One of the women in the department knew that she and I had both graduated from high school in 1978. Figuring that if I was six when I started the first grade, with a birthday in November, they deduced that I must have been born in 1959. Today is my birthday. 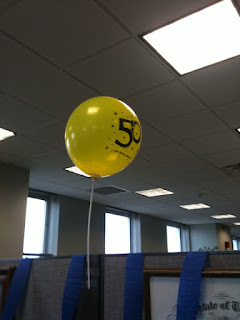 I came in this morning to find my cube all decorated with "50" balloons and a big party scheduled this afternoon for my "milestone" birthday. Only problem? I was born in 1960. And I work with a bunch of accountants - you would think they could do math! One more week . . . . .
To sign up for the Cardi Blogger Holiday Exchange! We've already got a great group of folks signed up to participate, but if anyone else wants to play, you have until next Sunday to sign up! Click on the Ornament Exchange logo to the right to get more info. Have I used up my yearly allotment of good luck? After yet another 10+ hour work day, I stopped at Sonic for a BLT and big diet coke for dinner. I was chatting with Laura, so I pulled up to a carhop slot and parked instead of going through the drive thru. After dinner was delivered, I turned the key to crank up the Element - and nothing happens. Dead as a doornail. I told Laura I had to get off the phone and deal with this. I sat for a minute trying to figure who I could bother on a Friday night to bail me out. Then I remembered - I had the good luck to have my car die right next door to an auto parts store. I hotfooted it over to the store, they came over and jumped it off for me, then put a new battery in and I was on the way home before the ice started to melt in my coke. I also posted video from Knoxville. The showsite had grooming upstairs and showrings downstairs (a real pain for the dogs and handlers) but it gave the opportunity to view judging from above for a change. I had a very interesting email yesterday. Earth Fare, a healthy supermarket, known for selling "foods that are as close to the ground as it gets" is opening a store Chattanooga in December. 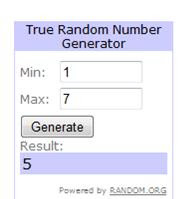 Their "Social Media Manager" found my simple little blog and contacted me, and Earth Fare wants to give away a $50 gift card to one of you lucky readers! Budgets always get really tight around the holidays. We all know that. And, Earth Fare, the healthy supermarket, seems to know that too. Have you been to their stores? 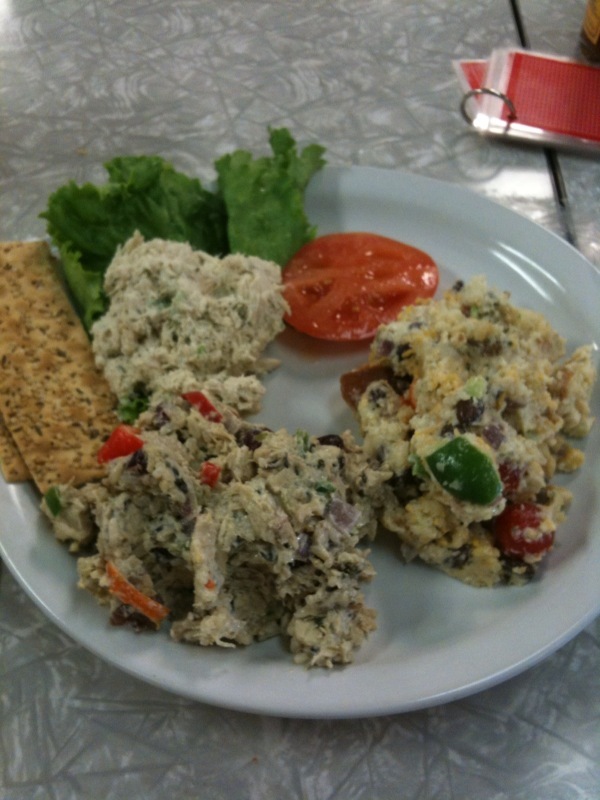 If so, you would know that they are always trying to make healthy eating affordable, easy and delicious! Seriously - have you tried their homemade, all-natural chocolate chip cookies - if not, it is .99 cents of deliciousness! Well, in celebration of the opening of their new Chattanooga store on December 9th, Earth Fare gave me a $50.00 gift card to give away! Yeah, very cool. They just said, hey Janet - give this away for us. So, now, we want you to tell us why you deserve or just plain want this gift card. We've all got stories. You may be hosting your family's holiday dinner on an extremely tight budget. You may have lost your job recently and just need some extra help to make it through this already tough season. 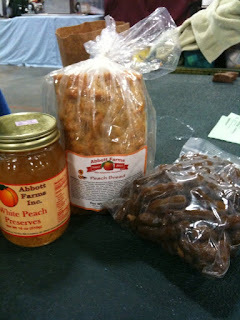 You may be a cookie lover or organic food nut! Or, perhaps for whatever reason, you've never tried a healthy food store and just want to see what it's like! Give us your best reason, and we'll consider it for the prize. The best story gets the card. So, ready, set, and get writing. Post your reason in the comments below today! You only have until Friday, December 4 to get your entry in. And, we're waiting.. They did me proud. Two QQs, two BOBs. This is what a bobbing for hotdogs hangover looks like. We head out to the show in Knoxville show in the wee hours tomorrow, so I'm posting a wee bit early. 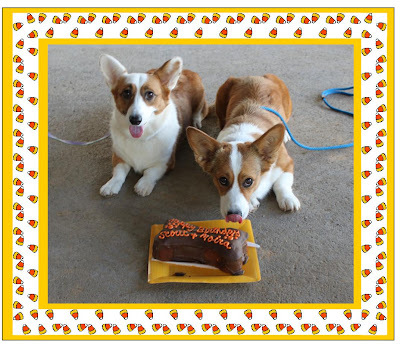 Happy Halloween Birthday to Honey and Brodie's kids: Grace, Fanny, River, Moira and my special little pumpkin, Scout. Thanks to Taryn for catching and sharing a sweet picture! Click on the picture to enlarge and get a good look at that tongue!! I couldn't decide what to title this post, so I used both thoughts which are about as disjointed as I am right now. Did you know that this is the last week of the first month of a quarter? Why would you? I do because it is the busiest week of the quarter for me. I won't go into the gory details as I don't want to be dooced, but suffice it to say that these are the times that make the rest of the year seem like a walk in the park. 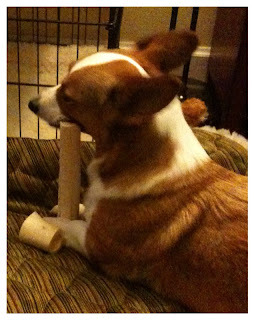 (On the other hand, Dooce makes a living by posting silly pictures of her dog on the internet . . . . . . , but as usual, I digress.) 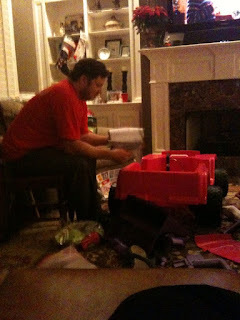 Anyhow - six months from now many of you will be having fun at the Specialty and I'll be doing this again. The last two weeks have been a string of 10 - 12 hour workdays. 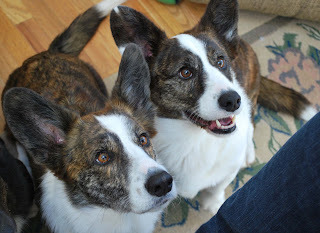 Scout's in season, so no doggie daycare, and the two of them have had a lot home alone time. 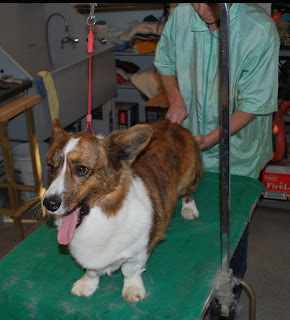 We're showing in Knoxville this weekend, so I decided to go ahead and take Scout to Cheryl's - she can take care of the bath and nails, and I can let Spencer go to day care and not feel so guilty about being gone from home so much. So last night I left work about 7:00, went home and loaded up the dogs and headed to Cheryl's, about an hour and a half away. Laura lives in the same town, so I stopped by and picked her to before going to Cheryl's. We got to her house and went inside to visit, leaving the dogs in the car. Usually, I will open the hatch door for the dogs, but it was a cool evening so I wasn't concerned. After we chatted a bit, I said that I needed to get going because I had another long day ahead. We went out to get Scout, and when I tried to open the hatch, it was locked - so were the other doors. Ok - guess where the keys were - yep - in the console. Now I have been driving that car 3 years, and I had come to believe that Hondas were idiot-proof as far the door locks went. I have no idea how the doors locked. There was much wailing and gnashing of teeth on my part. I asked Laura for the name of a parolee who knew how to break in a car, but she couldn't come up with one - but she did save the day with a coat hanger, two bamboo sticks and a roll of duct tape. An hour later we got away and I got the chance to play with Laura's puppies for a few minutes before heading back over the mountain to home. Scout helps out. 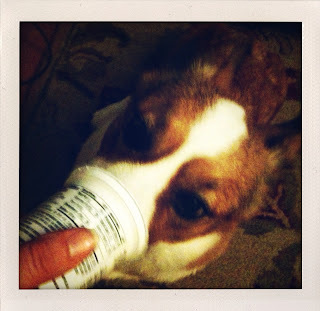 Notice how she pins her ears back to make it easier to get her entire head into the cup. How about some Cardi Blogger Holiday Fun? It's a chilly Saturday morning and I am looking out at the autumn color out my front window - and that made me think about how the year is coming to an end. Next week is Halloween, Thanksgiving will be here before we know it, and then we will be rushing right into Christmas and New Years. I have really enjoyed our little Cardi blogging community that has sprung up. It was so much fun meeting up with several of our fellow bloggers at the Specialty this year. So - it got me to thinking - is anyone interested in having a virtual holiday party? How about a Cardi Blogger Holiday Ornament Exchange? Anyone who cardi blogs, or just likes reading cardi blogs, is welcome to participate. I set up a new address - cardibloggerholidayxchange@gmail.com. If you would like to partipate, send your name and address by November 15. Include any other information that might be interesting to your partner who might not know you. I'll play matchmaker and send you your partner's information by November 18. Let's try to have packages delivered by December 1st for maximum holiday enjoyment! I hope you will also consider sharing the word via your blog as well - the more the merrier! Feel free to grab the little logo I made and put it on your blog, or design your own. I doubt she found what she was looking for . . . I was just looking at the feedjit gadget on my blog. I like to see where folks are visiting from, and sometimes I will check to see what they were searching for when I see that they got to my little blog from google. I've had several hits from folks googling "butterfly tattoos" from the post I wrote about Avery's birthday party. 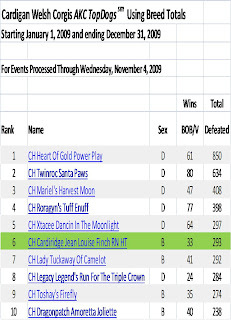 I also got several hits after I wrote about an email thread between me and Dina about what if Scout and her sisters had been high school girls. The post was titled "Honey's High School Girls" (Honey is the girls' dam) and you can imagine how disappointed the boys were when they googled and landed here. Of the canine variety, that is. Scout is, ummm, how to say this delicately. In college, we just shortened it to "h". That's it - Scout is h. Actually she is capital H. She wants a boyfriend soooo badly. 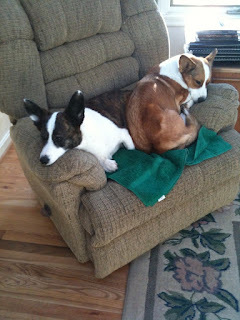 And poor Spencer, who was neutered at 6 months, has absolutely no idea why his adopted sister will not leave him alone. I just whispered to her - "baby girl - just get through this one. Next time this rolls around, we will find you a boyfriend." This was one of those Mondays when you look forward to getting back to work so you can recover from the weekend. I would have liked to have been able to be in two places at once this weekend. Spencer and I had fun at our club's obedience trials. It did my heart good to be around performance people. Conformation shows by their nature have a way to bring you down sometimes. I just so enjoyed the camaraderie - folks cheering and supporting one another. This was especially true around the rally ring - say what you will about rally - no, it's not as hard as regular obedience, yes - an experienced handler can lead a green dog to a title in a couple of weekends - but folks just have so much fun with it! And then 120 miles away, Miss Scout and Cheryl were pulling off back to back Group Ones. I was just pleased as punch for both of them - happy that we had judges who appreciated Scout and happy Cheryl got to take her in the BIS ring before her hometown crowd. It was really a thrill getting to be there Saturday to see it. Thanks to everyone who have sent along congratulations. Can't go to Nashville today - headed the other direction to see Mom. Been sitting on I75 for nearly two hours. Handler happy with red rosette. Also just heard Scout went BOB again. Showing in BIS wears a girl out!!! UPDATED with the rest of the story . . . 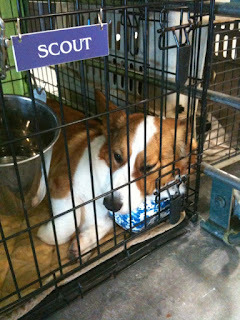 Scout won Group 1 today in Nashville. 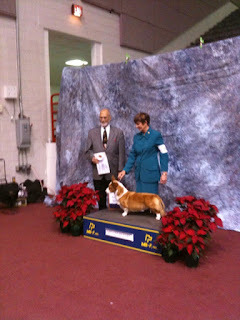 More later - but video of her in Best in Show ring is on CardiTube - click at right. UPDATE: Ok - I can type more now. That keyboard on the iPhone wears me out. As I posted earlier, I was working at our club's obedience trial this weekend, so I couldn't go to the Nashville show with Scout. About 3:00 this afternoon, Cheryl's friend Geri calls me and says, "Scout won the group." My immediate response was to laugh and say, "You're lying. How did she really do?" She said that she wasn't kidding, she really won. 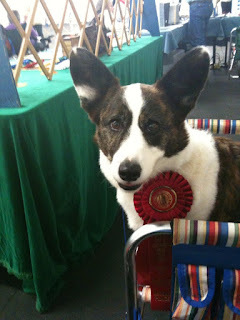 I was shocked, because the group judge had dumped her in breed just a few weeks ago. 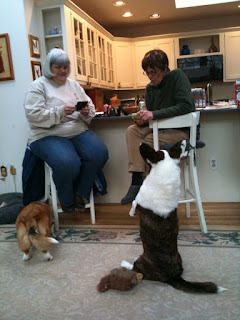 So, the Obedience trial was winding down - we were just waiting for Open B to finish so that we could award HIT. I was sitting there with my jaw hanging open when my friend Nancy walked up. I must have looked up at her with a strange look on my face, because she suddenly looked concerned and asked what was wrong. I told her the news and she started squealing. Suddenly it hit me that the herding group was the first group in. If I jumped in my car and headed out, I might just make it to Nashville (2 hours away) before BIS. Nancy said, "What are you waiting for? GO!!" Well, I left, but I really didn't think I would go. 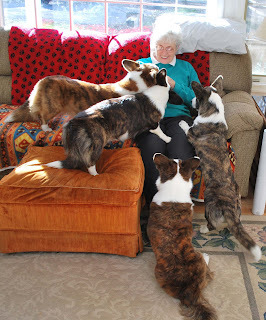 I had told my mom I would come see her this afternoon. But then I called Laura to tell her the news and she said, "Let's go! I'll meet you at the interstate." So I called Mom and begged off until tomorrow and hit the road. Reality set in, and as I started counting the minutes, I knew that chances were slim that we would make it. 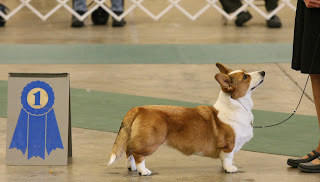 I was just about to call Geri to see what group they were on when she texted me and said there was a long delay because one of the group judges was still judging breeds. That gave me some hope. We made it - the last group was almost finished when we got there but we got to see her in the BIS ring. She showed so pretty today - it was worth every minute of the drive. As a bonus, Laura and I treated ourselves to a wonderful Greek dinner at a really cool little place near the showsite that we had found a few years ago. Usually we eat breakfast there - the best Eggs Bene evuh - which I thought I would get tonight but I went for the stuffed cabbage and zucchini and greek meatballs instead. trying to charm everyone who walks by my table out of some treats. I was just sitting here at my desk waiting for traffic to let up a bit before I went home and found a couple of pics on our doggie daycare website. These were shot last month when Scout was the hairless wonder. Not sure what dance steps they are practicing but the look like they are having fun.